In this new occasional series, we hear from Faculty of Fine Arts and Music students on what makes them tick, where they’ve been and where they’re going. First up it’s CJ Welsh, who recently graduated from the VCA’s Master of Producing program. My pathway to studying at the VCA was somewhat serendipitous. I finished an undergraduate degree in New Media at the ANU in 2009 and somehow found myself working in a completely unrelated industry, travel and sales, for six years. I was lost and wondering why I never did anything with my film degree, when I quite literally stumbled across the University of Melbourne Open Day in 2015. [VCA Master of Producing lecturer] Gus Howard gave a talk about the course and a chat afterwards convinced me to apply for the course. The kind of filmmaker produced at the VCA is the kind I want to be. I’m inspired by the tenacity of my fellow creatives. Watching their hard work come to fruition, and watching them push themselves to succeed makes me push myself. I read a lot of science-fiction and that inspires me too – seeing the positivity, faith and creativity that goes into imagining a future for the human race. That kind of imagination makes me feel like anything is possible. Set-backs, workload, rejections, creative blocks, negativity from others – it all adds up. When I started studying at the VCA, the biggest challenge for me was my friends and family questioning why I would quit a “stable” career in the travel industry to go into an industry fuelled by uncertainty and risk. It can be hard to explain to people who don’t feel the creative urge, but being surrounded by like-minds make it easier. 2016 was a huge year for me. As part of the Masters of Producing course, I produced three short films: The Last Man, Ruby Tuesday and Creating a Monster. The amount of effort required to pull this off was gargantuan; I had never pushed myself so hard before. It was exhilarating and terrifying, but in the end, absolutely worth it. I received the VCA’s 2016 Producer of the Year award and all three films were selected for the St Kilda Film Festival in 2017. In the next few years, my major goal is to establish myself in the industry as reliable and hard-working. I have several projects I’m developing myself including two web series and a feature film, for which I hope to receive development funding. If you want to pursue a career in film producing, it’s good to keep things in perspective. The pressure to succeed can seem overwhelming at times, but the relationships you form with your fellow creatives will not only help but also make it a load of fun. Don’t be afraid to lean on your colleagues and remember to be there when they need to lean on you. Want to learn more about how you can launch your producing career? Join course coordinators Donna Hensler and Stephen Luby for a webinar on Tuesday 26 March to have your questions answered. Mid-year applications close 31 March. Register now. 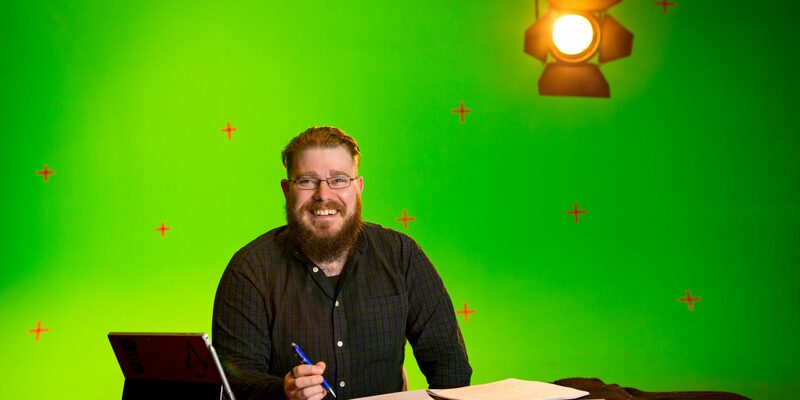 Image: Master of Producing student CJ Welsh at the Film and Television studios at the Victorian College of the Arts. By Sav Schulman. Find out more about the Master of Producing at the Victorian College of the Arts.